To cram all the information that you need onto one screen, Samsung takes the modern approach to screen layout. You’ll want to become familiar with several finger-navigation motions used to work with your screen. Icon: An icon is a little image. Tapping an icon launches an application or performs some function, such as making a telephone call. Button: A button on a touchscreen is meant to look like a three-dimensional button that you would push on, say, a telephone. Buttons are typically labeled to tell you what they do when you tap them. For example, you’ll see buttons labeled Save or Send. Hyperlink: Sometimes called a link for short, a hyperlink is text that performs some function when you tap it. Usually text is lifeless. If you tap a word and it does nothing, then it’s just text. If you tap a word and it launches a website or causes a screen to pop up, it’s a hyperlink. Thumbnail: A thumbnail is a small, low-resolution version of a larger, high-resolution picture stored somewhere else. With this background, it’s time to discuss the motions you’ll be using on the touchscreen. You need to clean the touchscreen glass from time to time. The glass on your phone is Gorilla Glass (made by Corning) — the toughest stuff available to protect against breakage. Use a soft cloth or microfiber to get fingerprints off. You can even wipe the touchscreen on your clothes. However, never use a paper towel! Over time, glass is no match for the fibers in the humble paper towel. Often, you just tap the screen to make things happen (as when you launch an app) or select options. Think of a tap as a single mouse click on a computer screen. A tap is simply a touch on the screen, much like using a touchscreen at a retail kiosk. This figure shows what the tap motion should look like. One difference between a mouse click on a computer and a tap on a Galaxy S8 phone is that a single tap launches applications on the phone in the same way that a double-click of the mouse launches an application on a computer. A tap is different from press and hold (see the next section). If you leave your finger on the screen for more than an instant, the phone thinks you want to do something other than launch an application. For example, when you press and hold on an application on the Home screen (the screen that comes up after you turn on the phone), a garbage-can icon appears onscreen. This is to remove that icon from that screen. And when you press and hold an application icon from the list of applications, the phone assumes that you want to copy that application to your Home screen. Don’t worry if these distinctions might not make sense yet. The point is that you should be familiar with holding and pressing — and that it’s different from tapping. You don’t need to tap or press and hold very hard for the phone to know that you want it to do something. Neither do you need to worry about breaking the glass, even by pressing on it very hard. If you hold the phone in one hand and tap with the other, you’ll be fine. On average, a person calls 911 about once every year. Usually, you call 911 because of a stressful situation. Like every phone, the Samsung Galaxy S8 has a special stress sensor that causes it to lock up when you need it most. Okay, not really, but it seems that way. When you’re stressed, it’s easy to think that you’re tapping when you’re actually pressing and holding. Be aware of this tendency and remember to tap. The same concept works on your phone. To overcome the practical realities of screen size on a phone that will fit into your pocket, the Galaxy S8 phone uses a panorama screen layout, meaning that you keep scrolling left or right (or maybe up and down) to access different screens. In a nutshell, although the full width of a screen is accessible, only the part bounded by the physical screen of the Galaxy S8 phone is visible on the display. Depending upon the circumstances, you have several ways to get to information not visible on the active screen. These actions include drag, flicks, pinch and stretch, and double taps. I cover all these gestures in the following sections. The simplest finger motion on the phone is the drag. You place your finger on a point on the screen and then drag the image with your finger. Then you lift your finger. The following figure shows what the motion looks like. The drag motion for controlled movement. Use a flick motion for faster movement. Better control of this motion comes with practice. In general, the faster the flick, the more the panorama moves. However, some screens (such as the extended Home screen) move only one screen to the right or left, no matter how fast you flick. Some screens allow you to change the scale of images you view on your screen. When this feature is active, the Zoom options change the magnification of the area on the screen. You can zoom out to see more features at a smaller size or zoom in to see more detail at a larger size. To zoom out, you put two fingers (apart) on the screen and pull them together to pinch the image. Make sure you’re centered on the spot that you want to see in more detail. 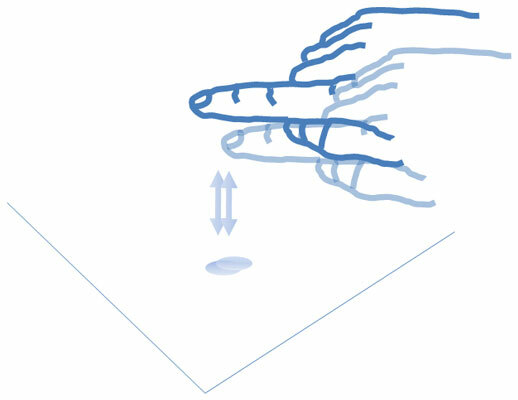 The pinch motion is shown here. 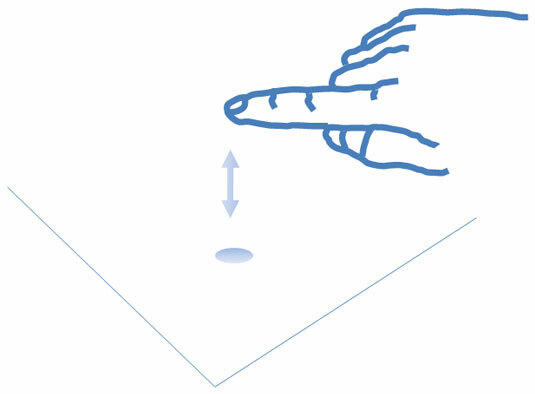 Use the pinch motion to zoom out. The opposite motion is to zoom in. This involves the stretch motion, as shown here. You place two fingers (close together) and stretch them apart. Use the stretch motion to zoom in. The double tap just means tapping the same button area on the screen twice in rapid succession. You use the double tap to jump between a zoomed-in and a zoomed-out image to get you back to the previous resolution. This option saves you frustration in getting back to a familiar perspective. When you double tap, time the taps so that the phone doesn’t interpret them as two separate taps. With a little practice, you’ll master the timing of the second tap.